Here are some images of Impacted teeth which are very Rare and we do not know whether they are Developmental Disturbances or Impacted Teeth. There are many types of Wisdom teeth Impactions depending on various factors which aid in its classification. Various authors have classified Wisdom Teeth like Archer, Pell and Gregory, Winters classification etc. But what we are seeing here is quite uncommon or rare as third molar and second molar teeth are seldom fused due to the difference in their development and eruption stages. 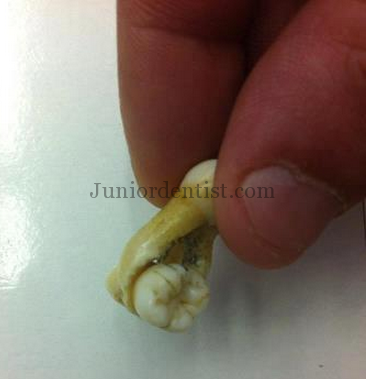 Here we can see the crown of an impacted tooth fused with the roots of an erupted tooth. Here we can see that both the teeth are well developed morphologically, the crown and root are well developed. 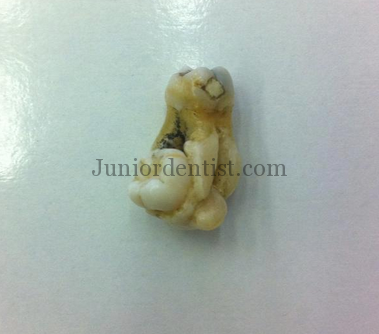 With the crown morphology, we can say that the impacted tooth is a 3rd molar the most common impacted tooth. For assessing the difficulty of removal of an Impacted tooth molar we use – Wharf’s Assessment Impacted Third Molar. Here is another angle of view to see the weirdly impacted 3rd Molar placed between the roots of adjacent 2nd Molar, it looks as if the 2nd Molar is holding onto the 3rd molar when it is falling down. The third molar appears to have grown in between the roots of the already erupted second molar. Although a very rare occurrence it is very difficult to extract as there has to be a lot of bone and tissue cutting done for removing the tooth without cutting it into pieces. This Impaction appears to be a Mandibular tooth looking at the occlusal morphology. With the impacted tooth extending cervically into the mandible te proximity to the Inferior Alveolar Nerve also increases making the dis-impaction surgery quite difficult.